Hello! My name is Mercy. I am hoping to become the most travelled little yellow sheep. Welcome to my blog! I've been sorting through my photos from our trip to Zimbabwe in April and here are a few I think you'll like! These ones are of me with the orphans in Muzarabani. We help these children be able to go to school and I heard about all the things they do in school! I was singing with the children in these photos. It's just as well you can't hear me singing because it was a bit noisy! The children are much better singers than I am. 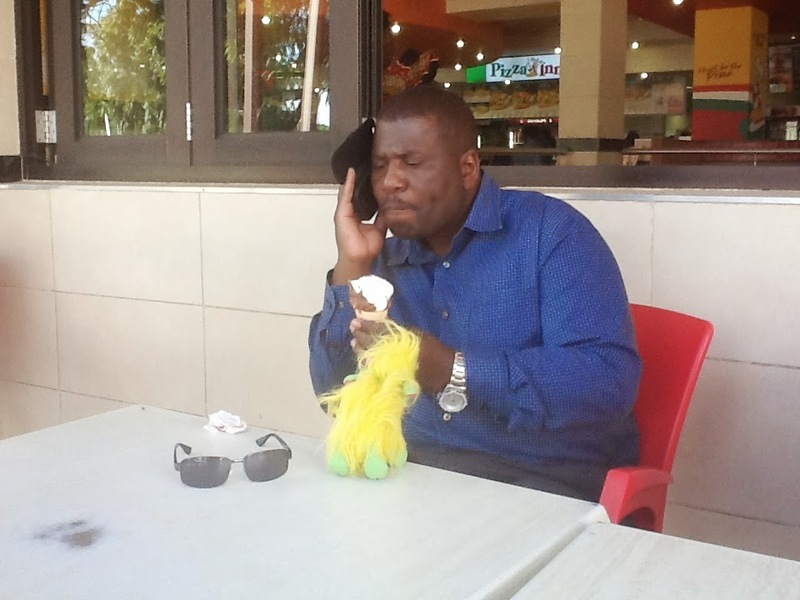 Here I was sharing ice creams with Norma and Pastor Silent. These two boys are Pastor Silent's two youngest sons. We had lots of fun together! It was Easter while we were there and I found this little Easter bunny. I tried to talk to it but it didn't have much to say! I met some children at the Easter Conference. They all wanted to hold me! Here I am with Norma and two of the Pastor's wives, Joyce and Chipo. Finally, this is me with the two senior Pastors, Simon and Silent. I had a lot of fun on the trip! Would you like to see more photos? Norma has some she'll be showing on Sunday morning after the service and everyone is welcome to stay and see them! She's going to be talking to everyone about a trip from Link Church to Zimbabwe next year. I'm going!! I hope lots of other people from church go too as that would be so much fun! Ice cream - my favourite! We had a lovely outing the other day. We went to Borrowdale where there is a shopping centre which Iain, Norma and Angela like very much. I'm not sure why humans like shopping so much, but I was happy they took me because we got some ice cream! 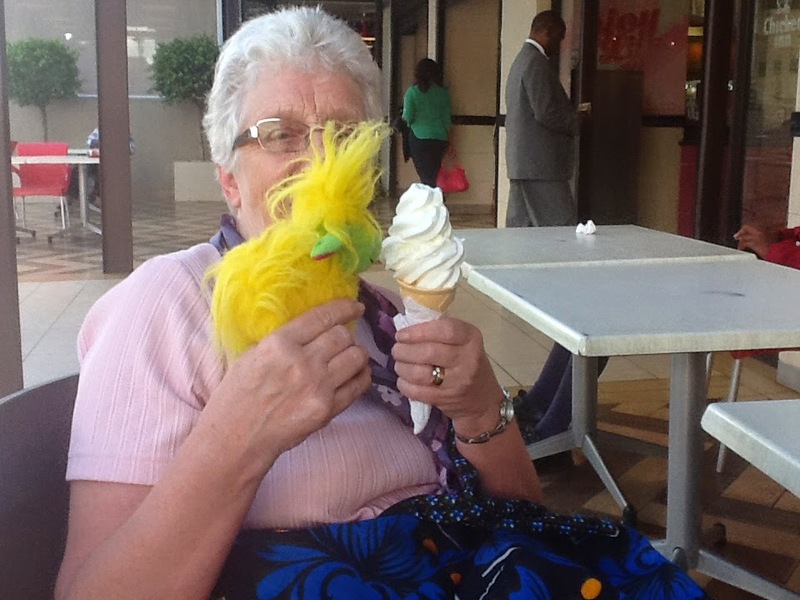 Norma was very generous and shared her ice cream with me! Yummy! We had some excitement the night before this because there was a HUGE thunderstorm! It set off the fire alarms twice! There is no hot water because of the power cuts so we are having to take cold showers. Brrrr! Pastor Silent's wife has malaria and is very ill just now. Please pray for her! Here I am with the children we help. We were able to speak to each one of the children we help to go to school and they have all drawn us pictures. They are very good pictures and we will show you when we get home! I told you last time that there was no electricity in Mzarebani and that I didn't mind much, since I'm a sheep. Iain, Norma and Angela found it quite hard though, especially as there were times when no water came out of the taps too! But it's much harder for people who live there as the power lines have been down for months, and only the people who have machines called generators - which make electricity - can use anything that needs electricity. Can you imagine what that would be like? What would YOU miss if you didn't have electricity for months and months? "I lift up my eyes to the mountains - where does my help come from? My help comes from the Lord, the maker of Heaven and Earth." We had a great weekend in Mzurabani! We met up with the orphans who get to go to school because of the money we send them. They sang us a song and then told us what they do at school. It was very interesting - some things are the same about going to school here, but some things are different too. We'll tell you more about it when we get home. Iain, Norma and Angela spoke at meetings for the church leaders and we went to the Sunday services too. It was VERY hot - I had to take my scarf off! There was no electricity either but that didn't bother me so much because, of course, sheep don't use electricity. We are back in Harare now and having a couple of days to put our feet up before it all gets busy again with the Easter Convention. We arrived safe and well in Zimbabwe! Today we are going to Muzarabani where we will get to spend some time with the orphans we know. It'll be good to catch up and find out how they are getting on at school! Later we have a meeting with some church leaders and Iain, Norma and Angela will be talking to them. Tomorrow we will be going to church. Please keep praying for us! It's been a while since I went on an adventure, but I'm off on a new one today! I am on my way to Zimbabwe with Pastor Iain, Norma and Angela. I'm so excited! We are going to stay the weekend in Muzarabani and Iain, Norma and Angela will be speaking to some leaders there and we'll be at the Sunday services. I'm most looking forward to meeting up with some of the orphans that get to go to school because we send them money to help with that. I can't wait to hear how they are getting on at school and some of the things they have learned! After that we will go back to Harare for the Easter Convention. People come from lots of different places in Zimbabwe for that so it will be great to see so many people and make some new friends! I'll be back to let you know what we're doing. Please pray for us! Hello everyone! We're back from Tanzania now and I've just been sorting through all the photos. Here are some of my favourites! You can see it had rained a LOT! In fact, I even joined in! Here are some of my friends, they enjoyed dancing too! Here's that centipede I told you about. He was HUGE! His feet are orange - mine are green.. I was listening carefully while Pastor Iain was preaching. Just to show you I cleared my plate. While sheep prefer grass, I am a missionary sheep and so will try just about anything while I am away. I can't remember what was funny here, but we laughed a lot!! 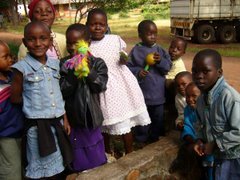 These children live at the orphanage we visited. This is where their water comes from. Chilling with Iain and Norma in Zanzibar. This is the life! I belong to the children of the Link Church in Dunfermline. I have a great time with all the kids there. We get up to lots of good stuff. Often I go on the most amazing adventures, because I am a missionary sheep! I write my diary, get lots of photos taken and write my blog while I'm away so that all my friends in Link Church know what it's like to go on these exciting trips. I hope you will enjoy reading my blog! Here I am with some of my friends that I met on a trip to Zimbabwe.